The gas flow to Ukraine halted Monday in Russia’s latest move to stun its former ally. Russia’s Gazprom — one of the largest extractors of natural gas headquartered in Moscow — claims Ukraine missed the deadline to pay its delinquent bills and negotiators failed to reach a deal on gas prices. Analysts said that the gas supply to Europe will continue as planned, but this could disrupt “the long-term energy supply to the region if the issue remains unresolved,” USA Today reports. This is one of many disagreements Russia and Ukraine have had over gas lines in the last 20 years. 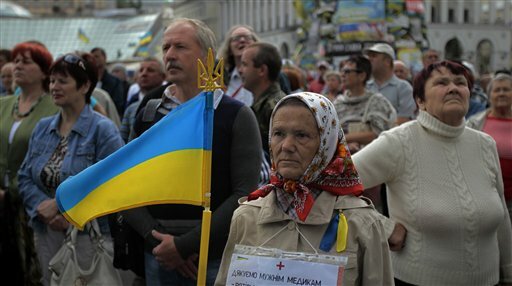 But the gas line disputes only scratch the surface of Ukraine’s recent misfortunes: Hundreds of people gathered in Kiev (Kyiv) on Sunday to mourn the 40 soldiers and 9 crew members who died after pro-Russia separatists shot down their Ukrainian military transport plane heading for the airport in Luhansk on June 14 [MAP]. Ukrainian protesters vandalized the Russian Embassy in Kyiv [MAP] shortly after the plane crash in protest over Russia’s alleged support of eastern separatists. NATO, meanwhile released images Saturday that it said showed recent Russian tank movements near the border [MAP]. An unconfirmed video account shows tanks moving in eastern Ukraine as early as June 12. A Russian military unit was spotted along the eastern border on May 30, but no tanks were present at the time the image was taken, NATO said. View a map of significant locations leading to recent events above.